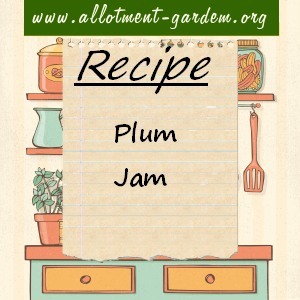 Plum Jam is really easy to make as plums have a lot of pectin naturally so setting is seldom a problem. Wash and wipe the plums. Cut in halves. Put into a pan with the water and simmer gently until the fruit is soft. Pot and seal while still hot. Makes around 6 lbs (2.7 kg) of jam. Well I have made the jam following this recipe and it seems to be ok, hubby has just tried the tester and he said it was very nice. You need to stir occasionally as you bring to a rolling boil to prevent it sticking to the base of the pan. Our plums have some insect trails, so far we’ve always washed, cut them in half (for inspection), quartered the pieces and then continued with cooking . Is this really necessary? How do you keep the bugs away? thanks, great site and good information. Just made this jam and it turned out the best ever, did take the tip to boil them longer to get the stones out if you have smaller plums. Got another 15lbs from my brother-in-law yesterday and am off again making more. Thanks for the lovely recipe, I have made loads today, we have been here in france for 10 years and this is the first year our plum tree cropped, got 4 kilos of plums, all turned into jam. Thank you for the recipe which worked a treat first time however on my second attempt I have not managed to get setting point even though I have added lemon juice. I have checked the jars today and it is quite runny is there anything i can do to rectify this. I have been and purchased a bottle of pectin but no real information on the bottle. Can I reheat the jam or do I need to discard it? I tried this recipe yesterday and it was a success. As someone mentioned previously, I crushed a few cloves and added some cinammon powder to give the jam a little twist. It takes quite a bit of simmering, about 50 minutes, but it’s well worth the wait. Thank you for this wonderful recipe. hi. Thank you so much for this lovely easy recipe. I was a little sceptical at first, worried that I wouldn’t be able to get the stones out, but I got 90%. The jam tastes really really good. All in all in took me about an hour and a half (simmering and boiling) but I have tonnes more plums so have frozen pre weighed bag fulls, and kept some aside to make some plum & banana bread, and crumble . One question, in the comments it says that 1.8Kg is the weight without stones – but I’m confused as I thought you leave the stones in till you cook. So what is the weight with stones ? About double? Would sugar marked jam sugar jam work. Or ordinary granulated? Ordinary granulated will be fine. There is no reason to pay extra for jam sugar (which has pectin in it) as plums are generally high in pectin. Hi, I am going to make some plum jam from your recipe, the only thing that concerns me is the amount of water to use. After looking at various other recipes non seem to use as much water ! HELP . Made my first batch of plum jam this weekend, and it is truly gorgeous. This is the second recipe I have used from your website and they are proving to be better than a lot of other recipe websites. Brilliant, I’m hooked! @Charlie: I was also concerned about using the water, but it works. 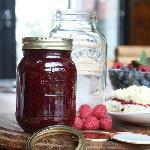 Hi found this site – followed the recipe, the jam is great. I’ve made 3 batches of it now, so easy. Thank you for the recipe . 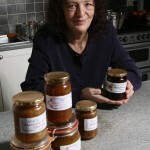 Hi, I made some of this wonderful jam two nights ago in a haste to use a huge bag of plums given to me by a neighbour. Then I realised I didn’t have any small jars! So used large kilner jars. Anyway, it’s come out so well I want to decant the jam into smaller, sterilised jars to give as gifts, but will this be OK? Is there a sterile way of doing it? Thanks! @Andrea Daley: Probably cherry plums (originally from Eastern Europe), used by local authorities as a decorative species. Pips and skin – the pips should float to the surface where they can be skimmed off, I’d leave the skin in. @Claire: If you are using Kilner jars or second-hand jam jars the inbuilt rubber seal should mean that you don’t need the disks. I have made some plum jam but waited for the 105 setting point and now its too set. Can I rescue it? I planted a plum tree in my back garden three years ago, it’s a miniature, the first year it only gave two single plums, last year there were five, this year THERE ARE HUNDREDS 🙂 So, this was the first recipe I found for plum jam and then I went on a mission, done everything but the jam has not set. Anyway, I’ve added cinnamon to the recipe and it tastes real good, shame that it didn’t set. hi, just made my jam from the first crop of plums in my garden. It gave 2 3/4 Lbs to which I added the same weight in sugar with 15oz of water. Worked well, set well, but very sweet. Did I add to much sugar? Your plum jam recipe turned out great. I added a few things, some cooking apple, cinnamon and star anise. When testing for taste I found it quite sweet and addded juice of half a lemon. It set beautifully and everyone said the taste was wonderful. I have the second batch on at the moment as people pleaded with me to give them a pot. I used it on the top of coconut buns and it was yummy. @Caroline: Caroline did you give it a brisk and very hot boil. Put two saucers in fridge and test until it gets crinkley on the saucer. Mine set perfectly, I’m not sure how much pectin is in the fruit, I didn’t use overipe plums. I currently have my fruit and water simmering. Stupidly at midnight but I’m making jams and marmalade as Christmas gifts, being quite frugal! This site is fantasic. Fingers crossed this batch sets and is all finished by 3am!! Oh my word, I have just finished and potted 7 1lb jars from this recipe. It is super sticky and tastes divine! Off to buy some more plums tomorrow so I have my own stocks for the year. Sod the xmas presents! Only a tiny thing I’d do differently, destone the plums first as I had to sieve and sure I missed some! I have just made my first batch 🙂 What consume by date can you recommend? A few weeks, a month? 2 months? It’ll be fine for 12 months (or more) as long as the jars are sterilized and sealed correctly and it is kept in a cool, dark place. If you are going to take more than a couple of weeks to eat an opened jar, store in a refrigerator. I use the recipe quantities above with great success. I always make plum jam without stoning the plums first because we have Japanese rather than free stone European plums and the stones are hard to remove without wasting plum. I bring the plums to a boil in the small amount of water, then when they are soft mash them with a potato masher to break up the fruit and use a Chinese-cooking type skimmer ladle to take the stones out before I add the sugar. I count the plums before I put them in the pot and write the number down, then I don’t forget how many stones I need to skim out. 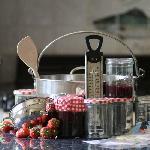 Just made runny plum jam – going to follow a few comments and try to thicken it up. NO NOT ME?? OTHERWISE I will just call it PLUM TOPPING. I am about to make my first Jam ever and brought a heap of plums, but because I’ve left them for a week, they are going on the soft side but still with a little firmness if you know what I mean. Would these still be ok to use? I agree with Peter and I also added 1/2 tspn cloves to take away the sweetness. I made plum jam once before, years ago and it was delicious. I wish I could remember the recipe. This turned out more like a sauce and I wasn’t 100% happy with it. Is the weight given for the plums before or after I have removed the stone please? After the stones have been removed. Packets of the wax discs, cellophane tops, elastic bands and labels are available on line, e.g. you should be able to get them on Amazon at very low cost. Sounds like you have got Damsons rather than plums – equally delicious. If like me you cant be bothered scooping the stones out and checking to see if you’ve missed any, cut the fruit in half, remove the stones, put them in some muslin and put them into the pot that way you get the flavour and just need to pull the muslin bag out at the end. Either way enjoy your jam. @Claire: I made plum jam recently but didn’t have wax discs handy so made them by cutting out disc shapes (by drawing round the jam jar) from baking parchment paper, it works and the jam is delicious. @Paul Digpal: Thanks for the tip about the pectin – I am trying to make damson jam but it is runny so will try grapefruit in it as that is what I have to hand. I made plum jam recently and put half a lemon in it with reduced amount of sugar – it was yummy and set perfectly. Thank you. I love thus recipie! As I had such a huge quantity of plums this year, I pitted and froze a freezers worth!! I have defrosted them as mentioned above, and the quantity of liquid/juice is huge! Should I discard it all? Use some of it to replace the water.